Recently we had an enquiry from an architect about wheelchair sizes. He wanted to confirm the standard size of a wheelchair because he was estimating the position and height of a WC pan for an accessible toilet. First off, there’s no standard issue wheelchair to measure from; there is design guidance. Part M that tells us how much space we typically need to allow that most wheelchair widths will safely and independently be able to use. Secondly, the building regulations Part M (even in the new standards) only tell us how we need to configure a space with appropriate height facilities such as toilets, basins and handrails. However, these reflect only one adult size of wheelchair and does not reflect the wide variety of wheelchair widths. To ‘guestimate’ how to meet the needs of wheelchair users is unwise, particularly when this group of people is so diverse and wide ranging. You may well end up causing more problems than you solve. Reducing wheelchair access. Way back, in the days of the Chronically Sick and Disabled Person’s Act (yes, that was the actual terminology used) the government issued a standard NHS wheelchair that was designed and built in Remploy factories, but today there are many varieties of wheelchairs and with our changing times that open up opportunities we find there are now many more considerations that need to be made – different sports chairs, outdoor scooters, chairs for rural rambling etc. are now all on the agenda. 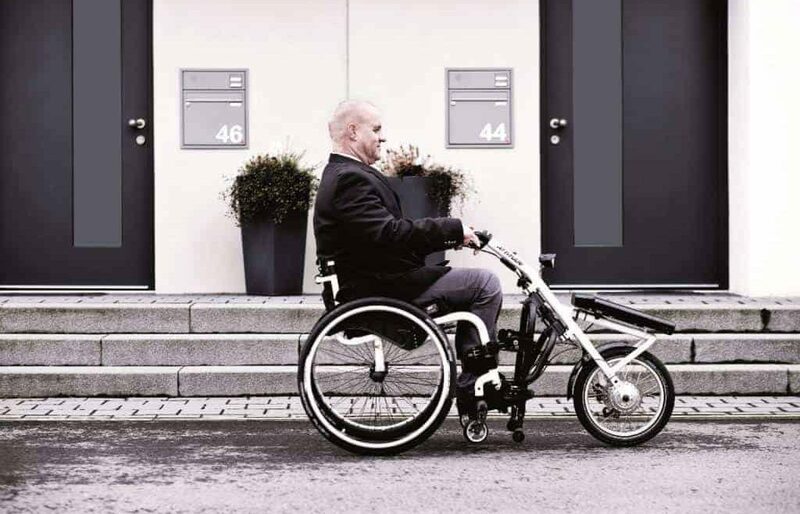 Technology means that wheelchairs today can be smaller, lighter and more adaptable to meet the demands of its diverse users. For example, take the Quickie Helium by Sunrise Medical. It’s an ultra-lightweight wheelchair made from carbon fibre; and reassuringly it’s been “Crash Test Approved” by the manufacturer. There’s also a fully submersible wheelchair for a swimming pool lift designed by Poolpod Products. This was first used at the London 2012 Paralympic Games for performance athletes but it is now available to the general public and leisure industry. But not everything is getting infinitely smaller and lighter; we have power chairs and scooters that are still quite large with heavy batteries to take you up hills, over rough terrain and up steep drop kerbs. Good inclusive design should mean that new outdoor environments and commercial developments can accommodate and meet the needs of different scooter and wheelchair users but there is very little advice available about how to do this. In the absence of advice and good practice then key issues can too easily get overlooked. In addition, with government constantly reviewing its guidance on healthy lifestyles and promoting physical activity there’s never been a bigger emphasis on adaptive sports for disabled people. All of us, including wheelchair users are encouraged to take up more sport and fitness. You need to be aware that there’s a different wheelchair for almost any sport you can name, and these not only are different sizes but can have more – or less – removable features (to squeeze through standard doorways for example, or to be stored more easily). A wheelchair for rugby (a combat sport) has different features to a wheelchair designed for sensible and unassuming tennis players (like me!). You will find that wheelchair widths can exceed 1m in some cases. An experienced access consultant from the National Register of Access Consultants will be able to help avoid typical pitfalls when designing to meet the needs of as many people as possible. In addition to providing a Part M Design Review (feedback on just how inclusive a design might be) a consultant can also carry out consultation with disabled people who will use your services. Having that conversation with disabled people can provide great insight and knowledge that you might otherwise not have. Most of us, through injury, pregnancy or illness, will at some point in our lives use a wheelchair. Remember – if you have an unsolved query about Part M, wheelchair access and wheelchair access width – we are here to help and give you guidance!